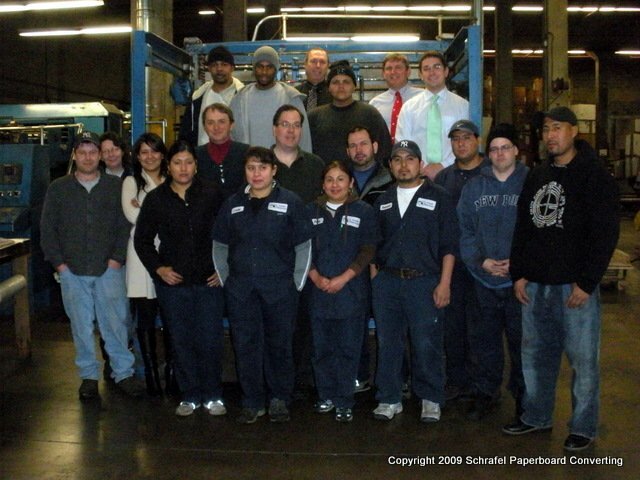 Schrafel Paperboard Converting in West Haven, Connecticut does the majority of A.J. Schrafel Paper's sheeting and warehousing. SPC also does contract converting for customers. SPC can warehouse rolls and skids for customers, sheet them to spec and deliver them just in time. SPC's staff is familiar with all the processes necessary to produce high quality products which will seamlessly run through your printing press or die cutter. SPC can customize the pallets that the paper is delivered on to meet the needs of the customer. SPC appreciates the fact that it is producing the foundation for our customer's products. All the effort that goes into producing a design is lost if that design is placed on a sub standard sheet. SPC does everything it can to ensure that the product the customer receives is as high quality as possible. SPC inspects all material as it is being processed and then runs it through a jogger aerator to ensure that there is no dust or trim in the stack. The stack is then stretch wrapped and banded to ensure that the stack is protected during transportation to the customer. SPC's West Haven Facility has 110,000 Square Feet of storage space. Conveniently located just off, I-95 West Haven CT, Exit 42. For step by step directions click on "To Here" on the map below. The objective of our business is to provide high quality paperboard products and reliable converting service for our customers. We aim to meet our customers needs and exceed their expectations. Our Employees are committed to provide our Customers with the best possible service and products. Their dedication and hard work are the foundation of our success.